Sometimes you want to go beyond a normal, dry survey question in your questionnaire. Including a video in your questionnaire is a great way to get your respondents engaged and to elicit rich feedback. With Survey Analytics it couldn't be easier to add a YouTube video to your survey question. And the really cool thing is you can add a YouTube video to any type of question that Survey Analytics offers! 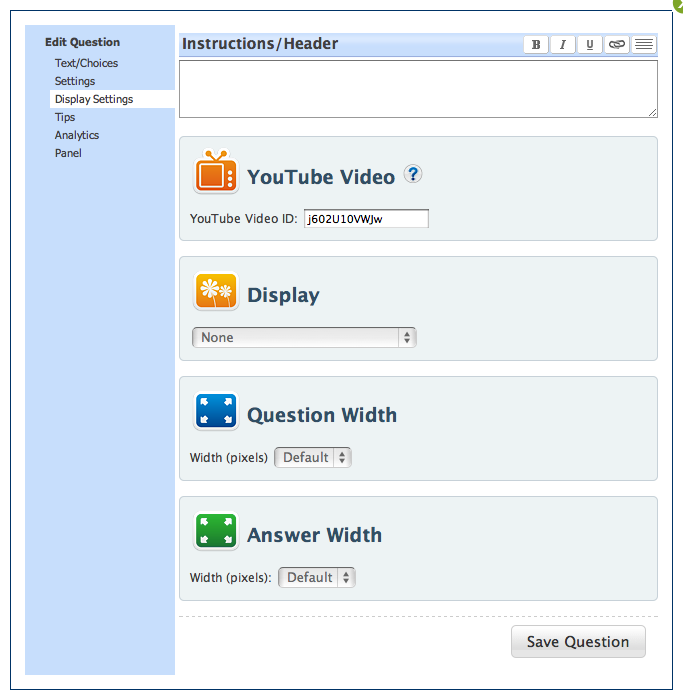 All you have to do to add a YouTube video is select "Display Settings" (see above) when editing your questionnaire. There is a place to insert a YouTube video ID. All you have to do to get the YouTube video ID is look at the URL of the YouTube video, copy it, and paste it into the YouTube video ID box in the Display Settings screen. That's it! Then the YouTube video "automagically" appears as part of your question! I hope you enjoy rocking your surveys out with lots of YouTube videos!